So what happens when you combine cheesecake and toffee? 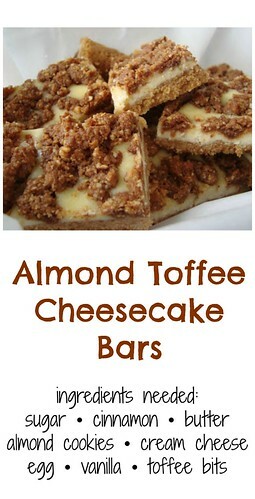 Well in this case, Almond Toffee Cheesecake Bars! I had some amaretti cookies left over from the Chocolate Amaretti Torte I made not too long ago which needed to get used up. Considering Victoria's Toffee was chock full of almonds inside and out, I figured a cheesecake crust made with amaretti cookies would work nicely. For the cheesecake filling, a simple mixture of egg, sugar, cream cheese and a splash of vanilla would carry the chopped toffee bits without being too overly sweet. Line an 8x8 in baking dish with parchment paper and spray with cooking spray. Place the sugar, cinnamon, and cookies in a food processor and pulse until you have a consistent mixture. Add the melted butter to the crumbs and process again until it's all incorporated. minutes. Remove from the oven and allow to cool slightly. While the almond cookie crust is baking, rinse out your food processor and add the cream cheese, egg, sugar and vanilla. Process until fully combined. Pour the cream cheese mixture into the cooled almond cookie crust. Going back to your food processor, place your toffee candy and process to a crumbly mixture. Sprinkle this processed toffee mixture over the top of the cheesecake filling. Bake in the 325 degree oven for 30-35 minutes. Remove from the oven and allow it to cool to room temp, then refrigerate for at least 2-3 hours before serving. These look so good!! I love toffee. Amazing! I want to jump into my computer sreen at these beauties. Yum! I could eat these through the computer! What a great use for the toffee. I think these bars are going to make you famous. These look and sound fabulous! Great adaptation, can't wait to make them! Oh yum, what a delicious idea! These look heavenly and dangerous to have around the house! I'm drooling! Toffee is fabulous... these would have to be brought to work to share though! Wow. I would kill to have one of these squares right now. I wanted to lick my computer screen when I saw this picture. It looks as though you made good use of that See's English toffee. Great use of your toffee - I love your recipe! OMG these look SO GOOD. I love everything about them! I just need a cup of coffee to go with this and I will be in heaven!! Almond, toffee and cheesecake are three of my favorite things! These look AMAZING!